When I started my previous Day Zero project I challenged myself to read 100 books in 1001 days. I failed miserably but I’m trying the Day Zero project, again and again, I’m challenging myself to read 100 books in 1001 days. I’ve started with the sequel to Discovery at Rosehill by Kathryn Brown. Secrets at Rosehill continues the story of medium, Camilla. She’s now very happily married to the former reverend, Marcus and they’re enjoying their lives at the gorgeous Scottish estate. She’s regularly visited by the spirits of former residents of the estate as well as family members, such as her grandmother. I like the way Kathryn reminded us of the happenings of the first story without making me feel like I was having to go through the first story again before I could get on with the new story. It was very cleverly done and I appreciated it because that’s one of the most annoying things for me when reading a series of books. Now married to Marcus Calloway, Camilla couldn’t be happier. Accepted as a medium by the local villagers, her beloved Rosehill estate is at peace. But when Marcus heads to London to help someone in need, messages from the spirit world cause Camilla to doubt her husband’s integrity. When her first love Ross, suddenly returns to Scotland, could her suspicions about Marcus’s infidelity drive her into his arms? And who is the spirit that continues to haunt Camilla, leaving her fearing for her marriage? 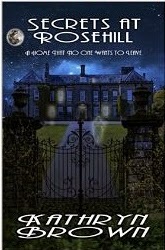 I really enjoyed Secrets at Rosehill and I’m now planning to read another of Kathryn’s books, Bedknobs and Bachelors. 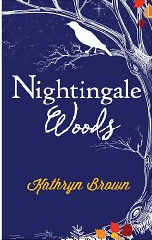 It’s the only one of the four she’s written that I haven’t read, the third being Nightingale Woods. Well I didn’t make my 100 book challenge. There’s no way I’m going to read another 65 books (still got 34 and 35 to write about) before the end of my day zero challenge next month! Anyway, here are my thoughts on The Judas Scar by Amanda Jennings. I got this book through the Britmums book club and it’s the first book from the book club that I’ve really liked and actually finished. Will and Harmony are seemingly very happily married but as you get pulled into the story, you find out there are a few cracks showing, mainly down to the miscarriage they’re both dealing with, or so we thought. Harmony thinks they can try again, but Will told her when they got married that he didn’t ever want children and it’s not going to be as easy for them as Harmony hopes. You’d think this would be enough for the couple to have to deal with but we find that Will is trying to bury his past, a past that is slowly shown to involve bullying at boarding school. It’s all brought right back to him though when his one time best friend from school, Luke, suddenly appears in his life. Harmony, Will and Luke’s lives become intertwined by present actions and past hurts. I wasn’t prepared for the ending, I usually see the twists coming and know what’s going on for most of the story but this one kept me in suspense and made me look forward to losing myself in the story each night. I was surprised to start feeling sorry for the bad guy and angry at the supposedly good guy. I had to remind myself that the good guy wasn’t a guy when it all happened, he was a child, a child with his own demons to deal with, at an age where he shouldn’t have had any at all. 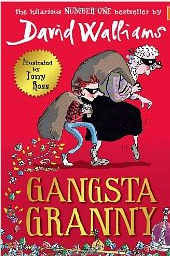 I was sorry to finish the book because I knew I was going to miss it! I haven’t updated my, ‘read 100 books’ challenge, I set myself as part of my day zero challenge recently so I figured it was about time I did, especially as I’ve got quite a few to add! 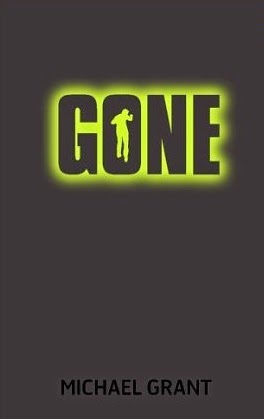 Aiden got the Gone series for his birthday last year. He read the first book and when he’d done he said I should read it. The last time he’d said that to me was after he’d finished The Hunger Games which he absolutely loved, as did I so I gave this a go. I have to say, I wasn’t expecting great things but right from the start this book totally grabbed me and sucked me in. Here’s a short synopsis, not written by me because I tend to waffle on and can’t really keep it short and without spoilers so this is from Amazon! Suddenly it’s a world without adults and normal has crashed and burned. When life as you know it ends at 15, everything changes. In the blink of an eye, all the adults disappear in a small town in southern California and no one knows why. Cut off from the outside world, those that are left are trapped, and there’s no help on the way. They must do all they can to survive. Chaos rules the streets. Gangs begin to form. Sides are chosen – strong or weak. Cruel or humane. And then there are those who begin to develop powers . . . It’s Lord of the Flies for the Heroes generation. It’s not for the faint of heart as some of it, and the rest of the books in the series, can be quite gruesome. 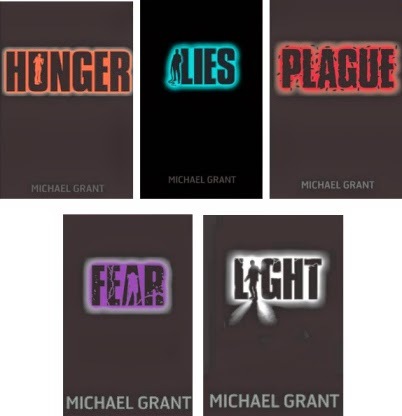 I’m not going to suggest an age range for this series of books because it really does depend on the maturity levels of the individual so what I’d say is to check them out yourself before letting your young adult read them. When life as you know it ends at 15, everything changes. The clock is ticking for Sam Temple and the kids of Perdido Beach but it’s not the big one-five that they face now; it’s starvation that threatens the FAYZ. In an abandoned mineshaft a faceless animal lurks, pulling the strings, toying with human and mutant alike. And he’s hungry – hungry in the darkness. An uneasy calm has settled over Perdido Beach. But soon, fear explodes into desperation as starvation sets in and the mob look to place blame. For the ‘normals’ the buck must stop somewhere: with the ‘freaks’. More and more kids are developing strange powers and, just as frighteningly, so are the animals in the FAYZ: talking coyotes, swimming bats and deadly worms with razor-sharp teeth are just the beginning. For Sam Temple the strain of leadership is beginning to show and he’s got more than just dwindling rations and in-fighting to worry about – Caine is back with the psychotic whiphand, Drake, by his side. And in the background lies the greatest danger of all – and he too needs to be fed. It happens in one night: a girl who died now walks among the living, Zil and the Human Crew set fire to Perdido Beach, and amid the flames and smoke, Sam sees the figure of the boy he fears the most – Drake. But Sam and Caine defeated him along with the Darkness . . . or so they thought. As Perdido Beach burns, battles rage: Astrid against the Town Council; the Human Crew versus the mutants; and Sam against Drake. And the prophetess Orsay and her companion, Nerezza, are preaching that death will set them all free. 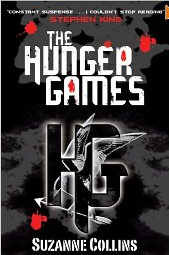 As life in the FAYZ becomes more desperate, no one knows who they can trust. The FAYZ goes from bad to worse . . . The Darkness has been foiled once again and the resurrected Drake has been contained. But the streets of Perdido Beach are far from safe. With a growing army of mutants fighting against the humans, power in the town hangs in the balance. In a small room of a house near the edge of town Little Pete lies ill on a bed. In his fevered dreams he continues his battle with the hidden evil that seeks to use his power to bring about anarchy and destruction. Night is falling in the FAYZ. Permanently. The gaiaphage has blotted out the sun and the barrier that surrounds the town of Perdido Beach is turning black. It’s Sam’s worst nightmare. With Astrid still missing and Edilio and Lana struggling to maintain order, Sam and his followers need all the courage they can get. As their world descends into darkness, only real heroes will survive. All eyes are on Perdido Beach. The barrier wall is now as clear as glass and life in the FAYZ is visible for the entire outside world to see. Life inside the dome remains a constant battle and the Darkness, away from watchful eyes, grows and grows . . . The society that Sam and Astrid have struggled so hard to build is about to be shattered for good. It’s the end of the FAYZ. Who will survive to see the light of day? The rest of the books in the series all kept me hooked and I have to admit to being quite sad when I reached the end of the final book, especially when I read the note from the author. It felt like I’d lost friends with whom I’d been on a long and exhausting, epic adventure! I was reading the paperback version of ‘Others’ by James Herbert a couple of months ago but when we went to Portsmouth I only took my Kindle as it was smaller and lighter. While Ant went to look at HMS Warrior (I needed to rest my sore ankle and back after walking around HMS Victory the day before) I went and sat in Porter’s Garden and spent a lovely few hours engrossed in ‘Wait For Me’ by Elizabeth Naughton. I knew from the first chapter that I was going to enjoy this book and when we returned home the next day I put ‘Others’ to one side in favour of ‘Wait For Me’. It kept me engrossed and wanting to go to bed to find out what was going to happen next. After a tragic accident left her with no memory, Kate Alexander struggled to fit in with a husband and world that didn’t feel right. She’s had no reason to question what friends and family have told her, not until her husband is suddenly killed and she finds a photo of a young girl in his office. A girl who can’t be anyone but a daughter Kate didn’t know she had. Ryan Harrison lost his wife in a plane crash five years ago. To cope with the pain of her loss, he dedicated himself to his job and to raising their daughter. Now a successful pharmaceutical executive, Ryan has everything a man could want–money, fame and power–but he’d give it all up in a heartbeat for just one more day with the woman he still loves. Two lives about to converge. As Kate begins to dig into a past she doesn’t remember, evidence leads her to San Francisco and puts her on the path toward Ryan, a man who sees in her the woman he loved and lost. Kate feels a draw to Ryan, one she can’t explain, but is that feeling enough to convince her this is where she’s supposed to be? As Ryan and Kate search for answers, they uncover lies long buried, a passion hotter than either expected and a danger that threatens…even now…when the second chance they’ve both been searching for is finally within reach. 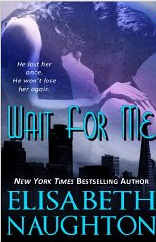 I think I’m going to try the Stolen series by Elizabeth Naughton next, they look really good! I didn’t realise I was watching a James Herbert story when I watched the film, Haunted, a few years ago and when I started this book all I could think about was the movie. I like to read the books first so that I don’t get stuck with the faces of the actors when I’m reading and I have to say that knowing the ending did spoil the book a little for me. However, it’s well written and if you don’t know about the twist at the end, I imagine it would be a very enjoyable read. Three nights of terror at the house called Edbrook. Three nights in which David Ash, there to investigate a haunting will be victim of horrifying and maleficent games. Three nights in which he will face the blood-chilling enigma of his own past. Three nights before Edbrook’s dreadful secret will be revealed…. And the true nightmare will begin Remember with Fear! 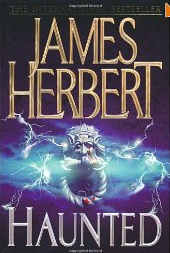 Another James Herbert book and I have to say it’s been a very long time since I’ve felt scared when reading late at night. Even when I went through my Stephen King phase, I didn’t find his books scary, not like watching movies (I can’t watch horror movies on my own because I get too scared to upstairs to bed!) but The Magic Cottage really played on the fear I have of someone out in the dark, watching me through a window. When I went to America to spend a month with my aunt, she lived in a beautiful big house with floor to ceiling windows and no curtains. I loved the house but when night time came, I couldn’t relax because it felt like someone was out there, looking in! The cottage sounds idyllic and it would be our dream to buy a cottage in the woods with a lovely little stream running through the bottom of the garden but I wonder whether I’d always be nervous, worrying about someone hiding in the woods, watching me. The book really struck a chord with me, as you can tell from this post….I haven’t even mentioned what the book is about really, just the effect it had on me! I just realised that I forgot to publish this post when I finished the book a few months ago! I now have another book post out of sequence, just to confuse me when I’m trying to keep track of the books I’ve read for my day zero project! 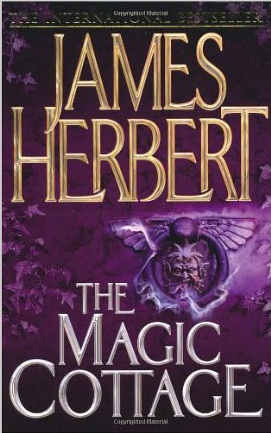 Anyway, onto my thoughts about the next James Herbert story that I read. You may have heard me mention that I’m a new James Herbert fan after watching The Secrets Of Crickley Hall last year on ITV. I’m really enjoying his books and this one didn’t disappoint. 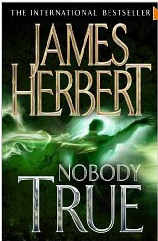 James True is able to leave his own body which he unfortunately does on the night someone murders him. We follow him as he tries to come to terms with his murder and to protect the family he left behind. However, he finds that this isn’t easily done when you can’t touch anyone or anything. It kept me turning the pages and made me have too many late nights when I just couldn’t put it down! To say I enjoyed these books would be an understatement! I haven’t read any books as quickly as I read these, in a long time. 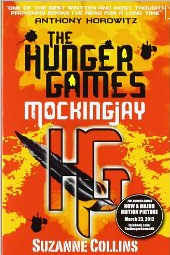 While we were on holiday in our glamping tent last October, Aiden borrowed The Hunger Games from the honesty shop and read it in a few days. He really enjoyed it so my mum bought him the trilogy for Christmas. He whizzed through them and I think it’s fair to say he seemed to enjoy them more than any other books he’s read, even Harry Potter! I know he loves the HP books but he wasn’t always getting his jobs done quickly so he could get back to them like he did with The Hunger Games. He kept telling me I should read them so once I’d finished Nightingale Woods I picked up The Hunger Games and didn’t look back. 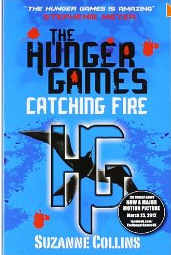 I started reading it around March 10th and yesterday I finished the third book. Three books in less than a month is a record for me (well, only since having kids! before that I could read a book or two a week depending on my job!). I was in turmoil because I wanted to read and read and read to find out what happened but I also didn’t want them to end and felt really sad when they finally did; it was like I was leaving some old friends, never to see them again. The writer did a brilliant job of getting me to care about the characters, I mean, really, truly care about them; I wanted them to be safe and get their happy ever afters. I nearly cried when people died, I felt their anger when they had to deal with the starvation and unfair treatment and I wanted more than anything, to kill President Snow! I watched the movie the other day and enjoyed that as well. I can’t wait to see the next two! 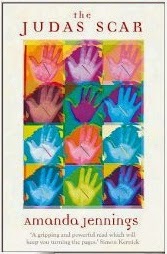 I wasn’t sure about this book when I first started reading it. I’ve discovered I’m not a fan of the diary format that’s used in the beginning of the book but the story was good enough to make me want to keep reading. I did enjoy it more when the diary part ended about half way through and for the most part, I wanted Rachel to get her man and live happily ever after, even though she’s the other woman! I don’t want to ruin the ending so I won’t say anything except that I was a little disappointed and felt it ended a bit too soon. I really can’t elaborate without giving away what happens so I’ll leave it there! 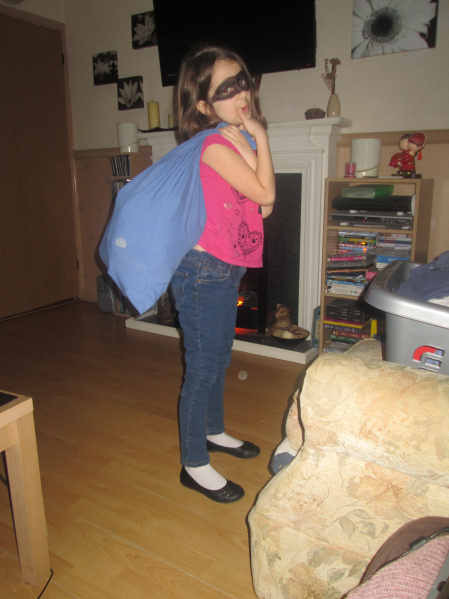 It got a bit stressful there for a while when both girls couldn’t decide which book character they wanted to dress up as but thanks to David Walliams and his Gangsta Granny, all we had to do was pick normal clothes, paint an eye mask on each girl and fill a pillowcase with some ‘loot’! 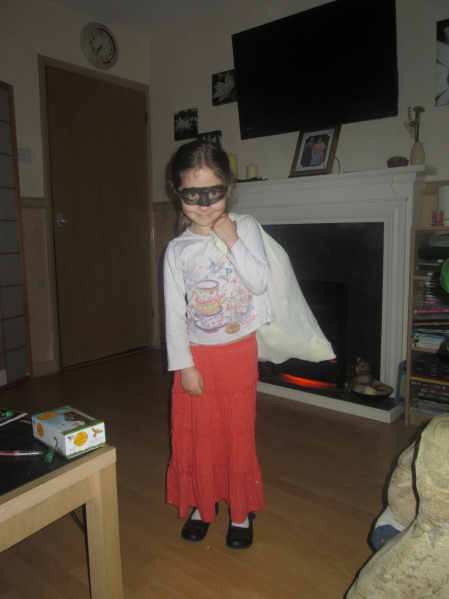 Ella was going to be the witch from The Wizard of Oz until she realised that being a Gangsta Granny meant she got to take lots and lots of things to school in her ‘loot’ bag that she wouldn’t normally be allowed!! She was very excited last night and said to Kaycee and Aiden, “guys, if we hurry up and go straight to sleep, morning will be here much quicker!”.